The world of Data Centers is evolving. Enterprises today need flexibility, agility and scalability. Intent-Based Data Center Automation enables Enterprise IT teams to plan, design, and build Intent-Based Data Centers that are enabling business transformation initiatives, such as digital transformation, agile applications, IoT implementations, cloud adoption, and client demands. Join Apstra in this live webinar on Wednesday, January 23rd at 10:00 a.m. PT / 1:00 p.m. ET to hear about real-world examples of why and how actual businesses are deploying Intent-Based Data Center Automation. You'll also gain a better understanding of how these businesses are using Intent-Based Data Center Automation to increase application reliability, simplify deployments, and reduce costs. Enterprises are building Intent-Based Data Centers to meet growing business transformation demands, operational efficiency expectations, and client requirements. These data centers are being empowered by Intent-Based Data Center Automation, which is built on technologies such as Intent-Based Networking, vendor-agnostic overlays, graph datastores, closed-loop validation, and advanced analytics. 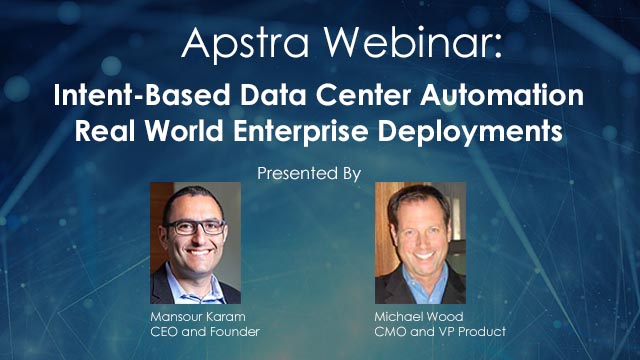 Join industry expert Sasha Ratkovic, Chief Technology Officer and Co-founder of Apstra for a live webinar on Wednesday, March 27th at 10:00 a.m. PT / 1:00 p.m. ET. Sasha will review the architecture of Intent-Based Data Center Automation and discuss the foundational technologies that make up this architecture. Cloud Service Providers are in the midst of several important trends in requirements including faster service delivery expectations, increasing revenue mandates, and the need to improve network security for their data centers. As a Cloud Service Provider leader, engineer, or operator you are also looking for ways to efficiently scale your operations, support changing on-demand services and reduce operational costs and capital spending. All of these challenges and requirements are compounded by flat-to-down budgets, limited staffing, demands for hybrid and multi-cloud, and our desire to up-level how we contribute to the business, technology, and the world. In this webinar, we’ll share unique survey insights, trends, challenges and opportunities that your peers are experiencing and what solutions they are considering that will address these demands. Join Scott Raynovich, Founder and Chief Analyst, Futuriom as he discusses Cloud Service Provider data center trends, challenges and opportunities. Enterprise IT teams are planning, designing and building Intent-Based Data Centers to address the challenges driven by business transformations which include massive digital transformation, cloud adoption, mobility proliferation, advanced applications, pervasive IoT, and end-user demands. Intent-Based Data Center Automation is key to designing, building, deploying and operating the Intent-Based Data Center. Join our guest, Lee Doyle, Principal Analyst with Doyle Research, in this live webinar to gain an understanding of how Intent-Based Data Center Automation is addressing the needs of the Intent-Based Data Center through increased application reliability, simplified deployments, and reduced costs. Data centers have experienced several significant transformations over the last 30 years. From the monolithic, oversubscribed data centers of the 1990s to the software defined, containerized data centers of the last five years. There are a new set of growing challenges that data center IT teams are facing as a result of massive digital transformation, cloud adoption, mobility proliferation, advanced applications, pervasive IoT, and end user demands. These challenges are driving the next major data center transformation. To address this growing set of demands, data center IT teams are planning, designing, and deploying Intent-Based Data Centers. Watch this webinar featuring Zeus Kerravala, founder and principal analyst with ZK Research, to understand trends in data center requirements, the growing challenges data center IT teams are facing today and in the future, and the solutions necessary to address these challenges. We are a well-funded startup developing game-changing technology that is transforming the data center network. We are hiring rock star C++ and Python software engineers and senior systems engineers who love the challenge of solving complex problems and pushing the boundaries of technology. Is this you? Bloomberg Intelligence hosted Mansour Karam, CEO of Apstra to discuss next-generation networking technologies, with a focus on Intent-Based Networking. Watch this on-demand webinar featuring Woo Jin Ho, Bloomberg Intelligence Analyst, Networking, Semiconductors. There is a lot of buzz around Intent-based networking (IBN), but there is still a lot of confusion about the difference between IBN and software-defined networking (SDN). Carly Stroughton and Sean Hafeez of Apstra discuss some of the issues with SDN and how IBN resolves them. Intent-based analytics (IBA) is a critical component of intent-based networking, responsible for ensuring that network services are delivered as intended in the face of constant change. Apstra founder and CTO, Sasha Ratkovic, explains what IBA is and why it is important for data center automation. Businesses running their data center networking business-critical infrastructure in a multi-vendor environment face a myriad of challenges around protocols. At scale, EVPN is incredibly complex. Apstra AOS, with new support for EVPN, simplifies the automated network experience in a multi-vendor data center. Hear from Apstra experts how to implement EVPN in minutes. Sean Hafeez and Carly Stoughton of Apstra discuss the causes of data center meltdowns and how Intent-Based Networking can prevent and mitigate these issues. Intent-Based Analytics enables network architects and operators to create high-level conditions for alerting on any set of telemetry from the network. The conditions are defined from user intent, so they are constantly updated when new devices or policies are deployed in the network. IBA "probes" can combine multiple conditions to minimize false positives and provide more relevant context, thereby decreasing operating expenses and eliminating unneeded troubleshooting. Any condition that can be described by the operator can be turned into a probe that will be checked 100% of the time without additional work. In this webinar we will provide an introduction to the exciting capabilities of this feature. Come learn how AOS can assist you. SaaS companies, telecom service providers and enterprises alike need to transform their networks to capitalize on market opportunities while reducing OPEX. This transformation is inexorably leading toward the development of autonomous networks. Apstra is leading this movement, and our intent-based networking system — the Apstra Operating System (AOS)™ — is taking another leap forward with powerful new features that will help enterprises increase their speed to market and ensure higher security levels for virtual and physical workloads. In the webinar "Introducing Apstra AOS for Virtual and Physical Workloads" Josh Saul will discuss and demonstrate several of the new features in the latest release of AOS that are critical steps forward in the evolution of autonomous networks. Apstra Operating System (AOS) 1.2 marks a significant milestone for network operations. New operational tooling -- out-of-the-box as well as user-created in Python -- means network engineers will get more done while making fewer mistakes. Join us for this AOS demonstration. Network infrastructure today does not provide the agility and availability to support business goals. As cloud, Internet of Things (IoT) and digital strategies take hold, network engineers need a solution for the data center network to increase their business velocity and close the gap between business demands and network service delivery. Join Wyatt Sullivan, Product Manager at Apstra®, on Thursday, May 25 at 11:00 AM PST / 2:00 PM EST as he discusses current and upcoming features in the Apstra Operating System™ that deliver a “command and control system” providing game-changing network service agility, uptime and dramatically improved infrastructure TCO. Ansible is a simple, powerful, and agentless open source IT automation framework. The Apstra Operating System (AOS) enables companies to build a vendor-agnostic, intent-based and closed-loop Self-Operating Network™. Join Damien Garros​, Customer Enablement Engineer at Apstra and Andrius Benokraitis​, Principal Product Manager for Ansible at Red Hat on Thursday, April 20 at 11:00 AM PST / 2:00 PM EST to discover how Ansible and AOS together bridge the gap between networking and DevOps in a useful and meaningful way! Gartner calls intent-based networking systems possibly "the next big thing in networking". But what exactly are "intent-based networking systems" and how will they affect you? Don't miss this opportunity to get an in-depth look at the future of networking. Over the past decade we have seen divergence in the architectures deployed in the hyper-scale world from those in the enterprise. We have also seen markedly different application architectures that enable more flexibility in network design. My goal in this session is to have a highly interactive discussion exploring the emerging skills gap in the networking community while also talking about methods to close that gap and enable a data center architecture that provides for scale, mobility, security, and simplicity of operations. Be among the first to learn about the latest advances in this game-changing product!